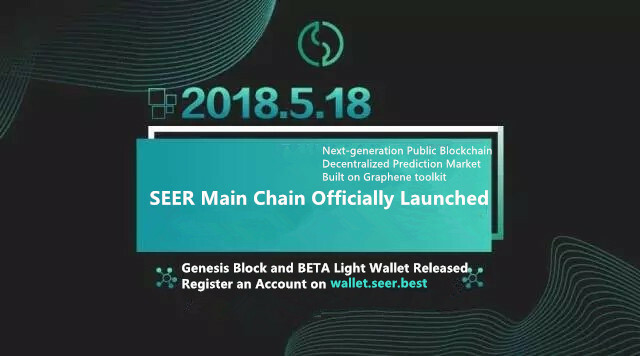 At 8:00 pm in Singapore time on May 18, 2018, SEER, the next-generation realistic forecast market Public Blockchain based on the graphene blockchain underlying framework, released the SEER main network V1.0 and the genesis block, completed the faucet account configuration, and released BETA version of the website light wallet. SEER users can access the official website wallet.seer.best to use the SEER web version of the light wallet for account registration and other operations. SEER users can transfer SEER tokens stored in the Exchange or Ethereum Wallets to the main network through the gateway, participating in the voting of the council, election of the witnesses, the mortgage, other community management and the forecast market activities in the SEER main chain network. SEER takes the DPoS (entrusted equity representation mechanism) as its community governance structure. The Committee members is the core of the SEER governance structure. The Committee member are selected by SEER’s token holders. There are 11 Committee members in SEER. Each voter’s voting weight is calculated as a percentage of its holding amount to the total amount of the system. The authority and responsibilities of the Committee member are as follows: 1. Adjust transfer fees; 2. Specify parameter settings for the blockchain; 3. Deal with disputes between the forecast market and the crowdfunding market; 4. Deal with the requests that challenge the oracle results; 5. Process proposals, such as dealing with developers’ salaries, marketing programs, etc. In addition to managing the parameters of the blockchain, the Committee member also need to deal with possible problems and disputes in the forecast market and the crowdfunding market. What is more important is to be the final gatekeeper for the correctness of the results from the decentralized oracle. In order to ensure that each decision can reflect the wishes of most token holders, every decision made by the Committee members needs the approval of the majority of the Committee members. Each Committee member is voted by the token holder. This allows the SEER to be able to operate with efficiency, democracy, and fairness, reaching an optimal balance point. Being a Committee member will not earn income in the SEER system. Witness is the name given to block producers in the Graphene Ecology. It is similar to the miners in the Bitcoin network and is the maintainer of the SEER ecological foundation. The main task is to maintain SEER’s network nodes and allow the SEER to achieve a multi-centered operation. Any user can download the node software, and runs SEER on a networked computer that satisfies certain conditions. Users can mortgage a certain number of SEER tokens to become witnesses. The witnesses make the production of blocks in turn according to the ranking of the number of mortgages, and obtains corresponding token rewards. Meanwhile, the mortgagee can enjoy the mortgage income as well. In the genesis block of the SEER main network, there will be 21 Active witnesses. The users will be selected as witnesses by upgrading their accounts, applying for witnesses, and mortgaging a certain number of SEER tokens to participate in the election. The top 21 users of the SEER mortgage will be selected as Active witnesses, while the others will be selected as the candidate witnesses. The Witness Reward parameter will be set to 31.536 million SEER per year for witnesses to maintain ecological network. As a result, each witness will receive 1.5 million SEER rewards each year. The number of witnesses and other parameters can be adjusted by the Committee members. The top 101 Witnesses and Candidate Witnesses in the SEER rankings can obtain the mortgage income. Mortgage income is related to the mortgage ranking and the number of mortgage SEER. Mortgage income will be settled and issued once every 24 hours. The total mortgage dividend payable per day = (fund pool – 630720000)/5400. The initial capital pool has 2 billion SEER tokens. Witness rewards and mortgage dividends are deducted from it, so the pool of funds will gradually decrease and the fees paid by the users to the SEER system will be added to the pool of funds. Candidate Witnesses only have mortgage income. Witnesses can enjoy Witness reward + mortgage income. The number of people who can enjoy the mortgage dividend can be adjusted by the Committee members.